I always loved The Road Warrior. 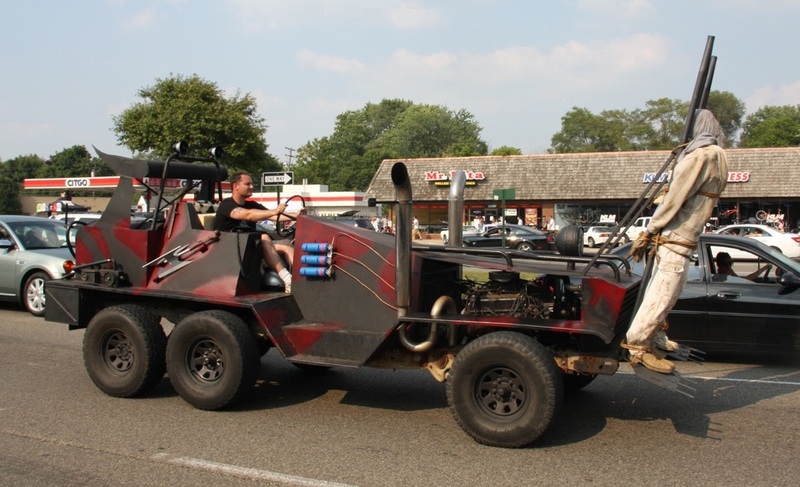 The makeshift armor and weapons, the muscle cars, the reluctant hero in black, your survival depending on your ability to adapt and improvise… it all had great appeal to the post-apocalyptic costumer that I would become. 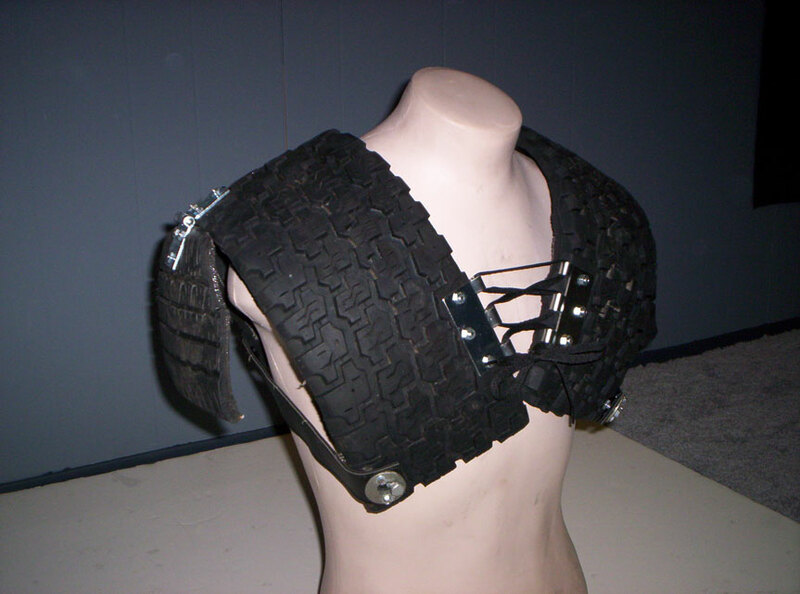 In my early teens, I would make my own primitive Mad Max inspired armor; pounding nails through baseball shin guards and piecing together sets of football pads. Soon I ‘evolved’ into making weapons and armor out of ordinary things. I was intrigued by the balance involved with making items that looked ‘cool’ and post-apocalyptic yet were still functional and practical. Sometimes I would start with something ordinary and make it into something dangerous. Like any warrior of the wasteland, I tried to use car parts, machinery, etc. Simply walking through a junkyard, I would pick out any given piece and turn it around in my mind. How could this be used as a weapon or armor? Is it sturdy enough? Is it too heavy? What could it be combined with? Or I would study a weapon (such as a sword) and wonder what kinds of parts could be assembled into a sword of my own. Yet another method is to start with something already dangerous and make it downright deadly. I love the out-of-the-box thinking involved with making your own equipment. A man is unbound by rules and governed only by what his mind can imagine. You survival is completely up to you and your ability to adapt, improvise, and overcome. It’s survival of the fittest, and that is what I love about post-apocalyptic costuming. When it comes to making your own items, it’s a good idea to can start with a certain item you want to make out of ordinary parts. For example, a sword. 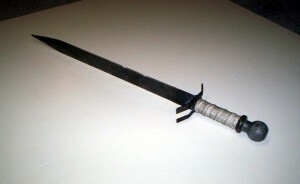 It basically has three parts: blade, crossbar, and handle/pommel. Spring steel makes a great blade once sharpened. Weld on a wrench for a crossbar. The pommel of a sword is nothing but a solid counterweight. What part of a vehicle fits that description? A trailer hitch ball, for one. Or a hefty hood ornament, like a Mack truck bulldog. There’s your sword. Another example is a circular saw blade. Sure, it might be threatening by itself, but cut it to the right size, weld it to a pipe, and you have yourself a wicked axe. 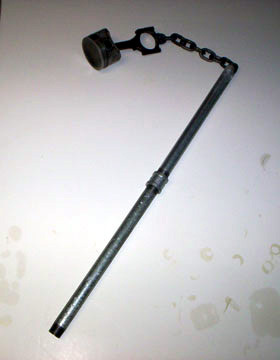 Take a piston with its connecting rod and weld it to a chain, then add a handle. Instant post-apocalyptic flail. 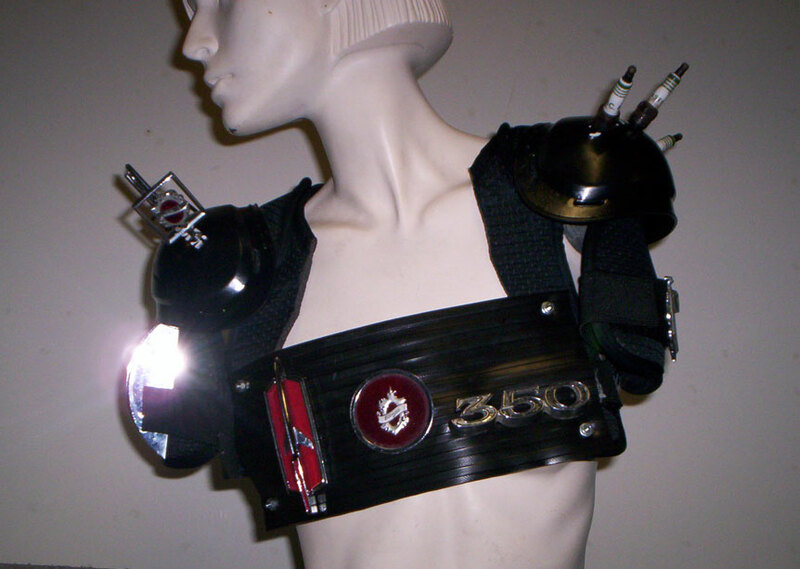 Small hubcaps can be made into chest armor for women, and larger hubcaps are great for bucklers or shields. A no-brainer is using a road sign for a shield. Interstate signs, especially, are good for this as they are already in the shape of a shield! A quick and easy way to enhance any armor is to adorn it with car emblems or insignias, like they were taken as trophies from defeated vehicles. Spikes are a quick and easy addition to just about any kind of sports pads. But more creative options are there, such as screwing in old spark plugs or hood ornaments. I learned how to cut tire tread, which is no easy feat and requires a bit of practice. But once you have your tread cut and made into armor, it actually provides excellent protection. Working with tire tread is difficult. Tire tread is hard to cut; with the thick rubber and the numerous steel radials. Then once you have it cut, all those radials become sharp needles; not a good thing to have on your skin. But fear not. A sawz-all with a metal-cutting blade will cut tire tread and radials, though you will need a large vice to hold it still as you cut. Then use a cut-off wheel on a Dremel tool to grind down any exposed steel radials. Also, bicycle, motorcycle, and ATV tires don’t have steel radials that make cutting tread so difficult. They are much easier to convert into armor. 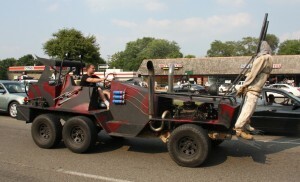 My advice is to get out there and brainstorm about what items you can use to make your post apocalyptic gear. Experiment with different materials and see what works best and what you prefer using. You’ve got no limits here, so floor the gas and see what you come up with. Another good point about post apocalyptic costuming is that it really doesn’t matter if it looks rough; it’s supposed to! Includes some sort of car parts/tools.